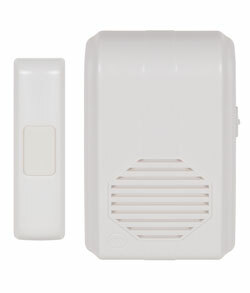 The STI-3350 is an easy-to-install musical wireless doorbell chime with no electrical wiring and no expensive through-the-wall drilling. Installation is as easy as mounting the button on the exterior of the door and plugging the receiver unit into any indoor electrical outlet in range. This musical wireless doorbell chime is easy to install, with no electrical wiring and no expensive through-the-wall drilling. Installation is as easy as mounting the button on the exterior of the door and plugging the receiver unit into any indoor electrical outlet. To extend coverage to more rooms, just purchase additional receiver units that can be plugged into any room within 500-ft of the transmitter. You can distinguish between front and back doors by adding more transmitters and programming a different tune on each. There are ten sounds that can be selected with the push of a button on each transmitter. For security, there are 32 individual codes to protect against outside interference. Unit is FCC certified. Two 3-volt lithium batteries for transmitter, included. The STI-3350 is compatible with STI-3300, STI-3360, STI-3610, STI-3301, STI-3353, STI-3601 and STI-3351. 32 individual privacy codes to protect against outside interference. Operates up to 250 feet.